100% fully mirror polished stainless steel pickguard. 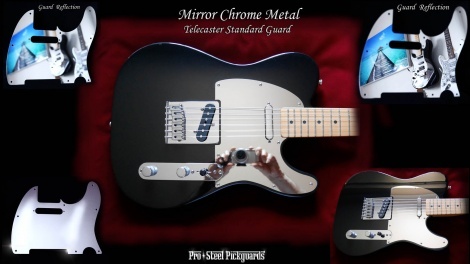 Mirror guards actually look really good on a Telecaster. It's a natural match with the Tele Control Plate. FITS -Genuine Fender USA or MiM Telecasters: Standard, Deluxe, Vintage, Modern Player, Select, Special, Baja, Modern, Esquire, and Signature models. Squier Tele's:Will fit Squiers, with maybe 1 or 2 screw holes a little off centre. if a standard Fender Tele guard fits your neck and screw placement, then this guard will fit.